When I embarked on Project Macaron earlier this year, I promised that I would share a no holds barred account of all the tears and failures in my quest for the perfect home-made Macaron. Here I present to thee the sequel. 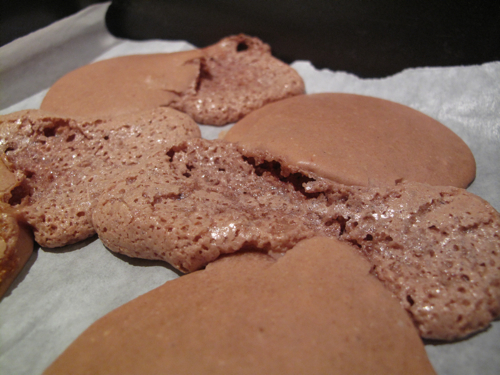 I must warn you to brace yourselves though because its a serious blooper reel of how not to bake. If there was a tribunal to prosecute crimes towards the Macaron, I would probably be served with a life-long ban from ever making them ever again. What when so wrong this time around you ask? For some reason, despite how blimmin’ long I spent whisking the egg-whites, they just didn’t want to rise properly and remained a thin, watery mess. 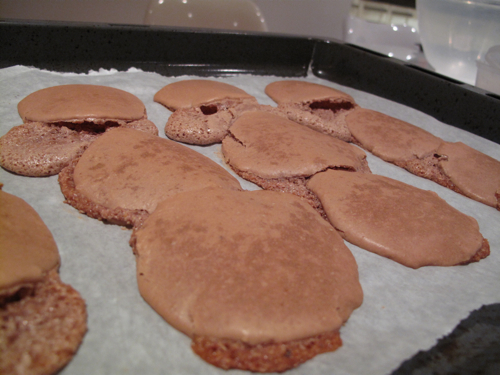 Hence, what resulted was a macaron mixture that was just far too wet to work with. I don’t even know why I even bothered to go through the pain of filling the piping bag and baking them. No pretty “feet” this time around… Just montrous looking pac-men that seemed more interested in devouring their neighbours than rising. I so knew when I managed to get decent shells first time around it was complete beginner’s luck. I will not give up. (Yet). Make sure that the bowl and beaters you use are completely free of any type of grease. Egg whites for some reason disdain grease and will not preform up to fluffy standards. Also using room temperature whites will give you a better result as well. Good luck having a sense of humor in the kitchen is always the main ingredient! mb: thanks for stopping by and also for the tips. Will be sure to make sure the bowl and whisking beaters are squeaky clean next time before starting! Won’t be giving up yet – hopefully it won’t be that disastrous come round 3. I tend to cheat and buy the egg whites in a carton. I’ve found that ageing them makes little difference, but letting them reach room temperature before using them does. I know for a fact that Ladurée don’t muck about ageing their whites. One thing that might explain it is if you tend to buy your eggs and then put them straight in the fridge. This can make the whites thin and makes the eggs useless for poaching, so if they’ve been in the fridge a week or so it might have affected your ability to get them to make peaks. I have a friend who swears by adding a pinch or two of xanthan gum to thicken the whites if this happens. suzzlecakes: I didn’t know you could buy egg-whites in a carton! – will certainly have a closer look to see if my local supermarket does them as would save having a whole lot of yolks lying around (i’m slowly running out of ideas as to what to do with yolks alone). Tx for stopping by and the words of encouragement. i will soldier on =). Oh Wow. What an ingenious product! Will def be looking out for this next time I’m at my local Waitrose. Thanks for the recommendation! SuYin: That’s actually a bloody great idea. All I’ve been doing with my egg yolks is having it with Indomie goreng ;P. Haven’t had Kaya in absolutely ages. Do you have a good recipe you use that you could share with me? awww……practice makes perfect. 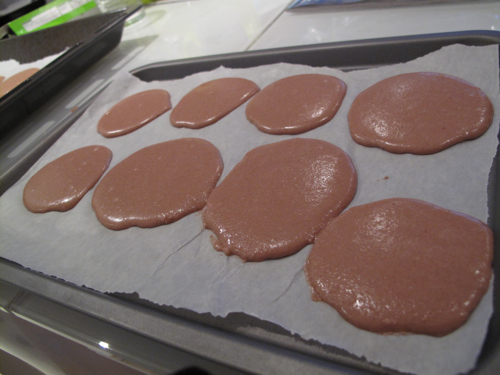 Macaron are really hard to make. I havent even attempted those. Can’t wait to see take three. Am sure you will get them just perfect! Kay: Tx for the words of encouragement. I’m actually thinking of making a batch today, so will see how it goes! Hey Guan~! You’ll need to use fresh egg whites – meaning that the egg itself has to be quite fresh. No aging is required. And your friend is right about having your utensils as dry as possible, because even a drop of water/fat can affect your meringue. Matt: Tx for sharing LCB’s trade secrets =). Will be sure to clean the bowl and utensils till it is squeaky clean and dry!! Vivien: I plan on giving it one or 2 more goes in the coming months, but i can imagine if it continues to fail that I may start thinking about abandoning ship!